gradient field. Pulse length, amplitude, readout-length and –delay can be chosen freely. The RFPA successfully amplied rect- and sinc-pulses generated by the spectrometer. A signal amplitude of 500mV at the input leads to an output voltage level of 200V which corresponds to a total gain factor of 52dB and a power level of 800W in a 50Ω system. 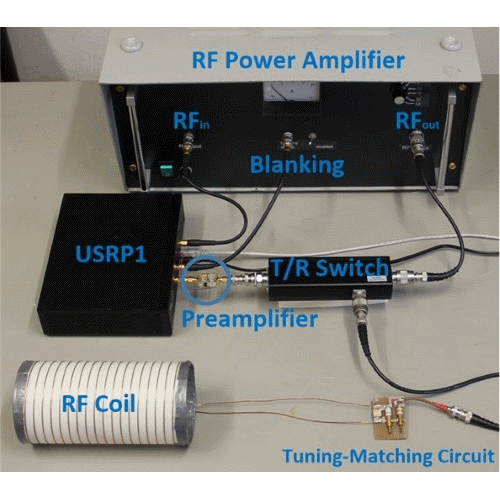 The RFPA shows good linearity for the investigated frequency range f=1.8-54MHz (B =0.042-1.27T) with a maximum power output of around 1kW peak power. The whole system occupies a volume of around (50x30x35)cm3. Do you want to join our discussions and get news and updates about the projects? Talk to us over Slack! Do you work on an open source project with potential application for MRI or other related medical research and technology? We will also highlight early stage projects (prior to a stable release and documentation) in order to improve collaboration at that early stage. Here you can find an overview of open source hard- and software projects, current progress, contact persons and links to the development and documentation websites. We just started, more projects will be uploaded very soon.